Now that fall is officially here, it’s time to prepare your home for cold weather. These 5 maintenance tips to prepare your home for winter, most of which you can do yourself, will help lower your utility bills and protect your investment. For about $80 to $100, a technician will inspect your furnace or heat pump to be sure the system is clean and in good repair, and that it can achieve its manufacturer-rated efficiency. The inspection also measures carbon-monoxide leakage. If you act soon, you’ll minimize the chance of being 200th in line for repairs on the coldest day of the year! This is especially helpful in rooms with high ceilings — and it might even allow you to turn down your thermostat by a degree or two for greater energy savings. If your gutters are full of detritus, water can back up against the house and damage roofing, siding and wood trim — plus cause leaks and ice dams. Winter is just round the corner, and reading such an article really helps. 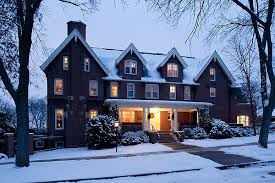 I will be taking these tips to make my home better in winter. As winters are very cold we need to prepare ourselves as well as our home from the winters. These tips are really useful and that too in budget. Thanks for sharing such an article with such useful information.